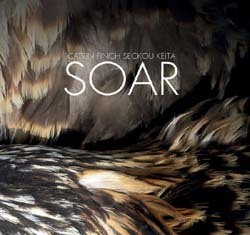 In both tradition and innovation, virtuosos Catrin Finch (harp) and Seckou Keita (kora) have found special common ground. Soar is a follow-up to their first collaboration, 2013's Clychau Dibon, and finds the singular duo creating astonishment through a combination that seems as inevitable as it is surprising. The album's title makes reference to the osprey, a species whose migratory path between Wales and Senegal (the musicians' respective birthplaces) was restored through the efforts of the Dyfi Osprey Project. The opening "Clarach" is, in fact, named for the first chick bred by said project to make its return to Wales. In some aspects suspended and in others grounded, it shifts from a minor to major mode with the patience of a sunrise. The images therein suggest more than a flight path between continents, instead encompassing less mappable paths into terrains of the heart. And really, that's what this music is all about: stretching our differences so thin that we can only see each other through them. It's an ethos made clearest in "Hinna-Djulo," an older piece in the duo's repertoire that aptly translates to "soul strings," and "Téranga-Bah," the title of which means "great hospitality" and speaks to the welcoming spirit that imbues every moment of its articulation. Keita's sung refrain of "open the gate, open the gate" bids us to leave our cares at the door and step over the threshold into a space of warmth and love. Other tunes intersect in more personal ways. "Yama Ba" was written by Keita's uncle, Solo Cissokho, and is dedicated to a Fulani woman who emboldened Cissokho's career, while "Listen to the Grass Grow" is an interlude by Finch about the quieter moments of life. Graver concerns frame "1677," a song harking to the colonial rule of Senegal by the French, and "Cofiwch Dryweryn" (Remember Tryweryn), another Finch original referencing a Welsh village tragically flooded in 1965 to make a reservoir. Whether in the former's rocking of slave ships or through the latter's remembrance of thoughtless destruction, water functions as an urgent element that heals even as it divides.